As a Linux user, I am sure, you will be interested to know which is the most popular Linux distribution. 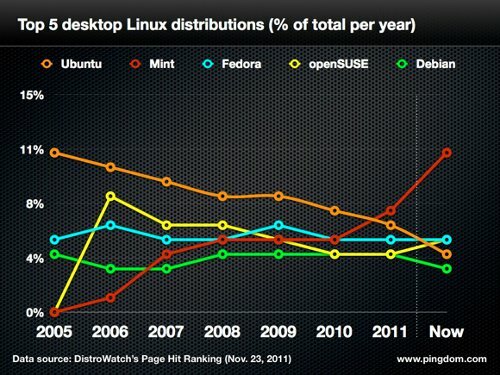 Till recently, if you go by Distrowatch stats, Ubuntu ruled the roost as the most popular Linux distribution. However, after Ubuntu team made a switch to the Unity interface, its popularity has declined considerably. Recently, Pingdom conducted a survey in which it was found that a new contender has taken over the top spot as the most popular Linux distribution. And it is none other than Linux Mint. Linux Mint is a fine Linux distribution. It is pretty, is green (literally), and is easy for the lay person to use. If you download the DVD image, it comes with all the media codecs installed by default. It also comes with a good subset of useful software catering to every need. If you go by the stats from Distrowatch.com, you will find that Fedora and OpenSuSE has overtaken Ubuntu in user popularity. But it is Linux Mint that is currently leading the popularity race. In its report, Pingdom states the situation is so severe that Ubuntu's popularity has declined by 47.2%. Where as, Linux Mint has seen a popularity surge of 105%. Ubuntu can take solace in the fact that it is still one of the top 5 Linux distributions. Though it cannot call itself the most popular any more. To be fair to Ubuntu, you can replace Unity with GNOME Shell and it works really well. The problem lies with the Unity interface (which IMO needs a bit more work) and not with Ubuntu itself. Linux Mint on the other hand is a well designed Linux distribution but with one caveat - namely advertisements. The Firefox web browser in Linux Mint defaults to the Custom Google Search. And the advertisements you see are ugly and a real turn off. What compounds matters is, they do not provide an easy way to revert to Google classic search in Firefox. If you are a Linux Mint user, you have to put up with the ugly Google custom search riddled with advertisements. [See the update below]. Linux Mint team says these advertisements help them fund the project. Advertisements are no doubt a viable stream of revenue. And in all fairness, I am not against running ads. But the Linux Mint team can at least make those ads look pretty, and less intrusive. Moving on, Fedora is a polished Linux distribution with the Red Hat clout behind it. And the latest version - Fedora 16 is worth trying out. OpenSUSE and Debian as well are excellent choices for use by people with computing needs. Search engines who do not share the income generated by our users, are removed from Linux Mint and might get their ads blocked. It won’t only be down to donations and sponsorships anymore, your activity on the web, every search query you make and product you buy will help fund our project.